“Happy is the man, I thought, who before dying, has the good fortune to sail the Aegean Sea” quoted Nikos Kazantzakis, the author of Zorba the Greek. On a recent Mediterranean cruise, my hubby and I had the opportunity to visit a few of Greece’s magical islands. 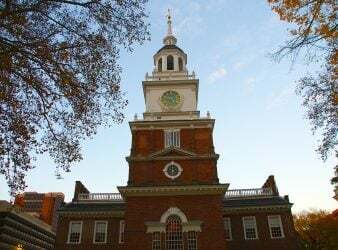 A snapshot visit, yes, but what we experienced not only made us want to come running back, it left us hungry for more. Unbelievably, the maritime country of Greece has over 6,000 islands and islets scattered throughout the Aegean and Ionian Seas, of which only 227 islands are inhabited-truly a unique phenomenon for the European continent. Two of these remarkable islands provided unforgettable memories as we traveled through the archipelago that for many travelers like us, captures the very essence of the isles of Greece. The archetype of the idyllic Greek Island has to be Santorini. A Greek friend once told me “Santorini is magical. It makes people fall in love all over again”. Being a romantic, that comment alone was enough to pique my interest. 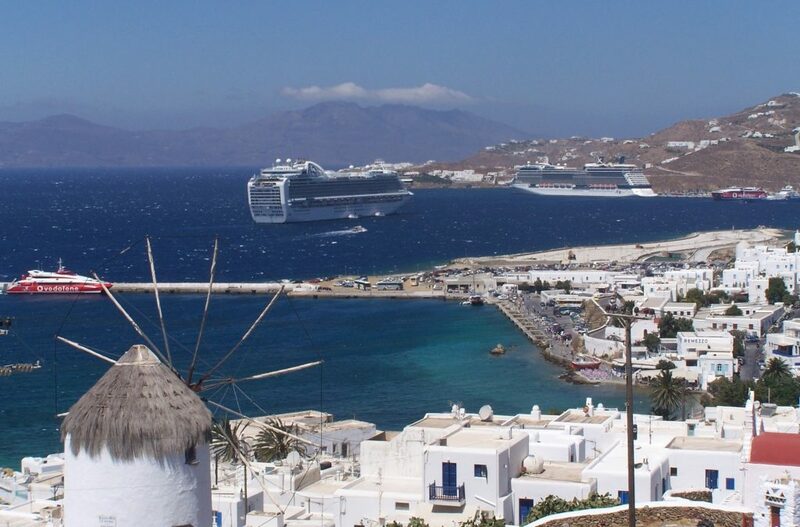 MilesGeek writer Hollin Stafford wrote up a great review of their week on Santorini. 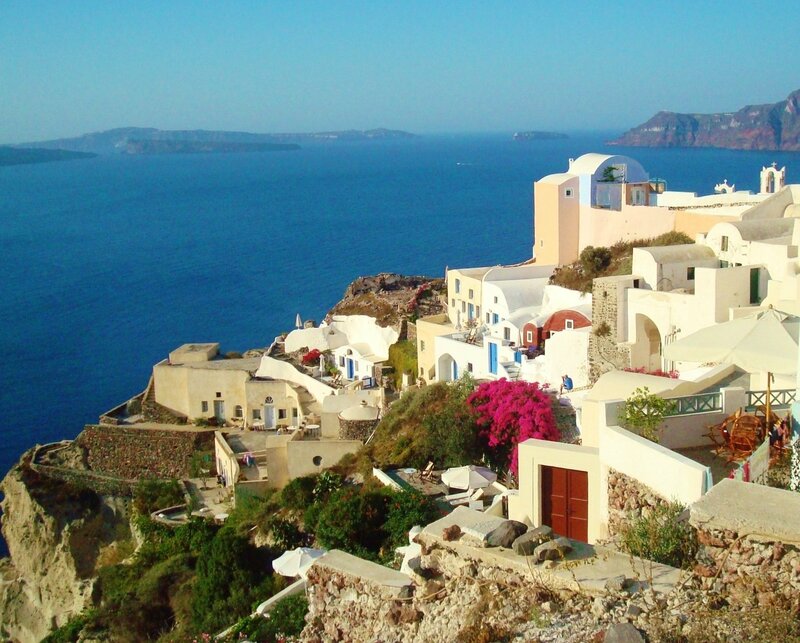 Having one of Aegean Seas’ most unusual landscapes, the island’s official name is Thira. Speculation is rife that Santorini may actually be home to the lost city of Atlantis – the legendary capital of a prosperous, advanced civilization Plato described as a paradise that disappeared without a trace, sunk into the sea by the anger of the gods. Whether the myth is true or not, it is a fact that Santorini is widely considered one of the most beautiful, idyllic islands in the world. There are few travel destinations that combine beautiful beaches, spectacular scenery, ancient cities, amazing restaurants, some of the world’s best wine, and an active volcano. And fewer yet that can completely capture the imagination, even before setting one foot on its mystical soil. Huge, towering cliffs, rising from the ocean floor loomed over the landscape on our approach to the island and Santorini’s port. Like an enormous crescent moon, the island encloses the crystalline cobalt waters of its ancient caldera. Whitewashed sugar-cube houses appear pasted onto high cliff tops. 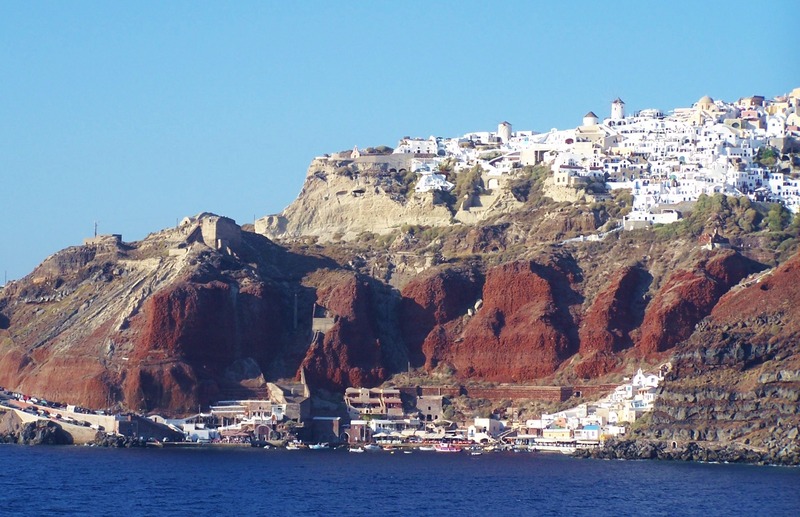 Once ashore, donkeys carried us up the 588 winding steps with numerous switchbacks to Fira, the small village that serves as the cultural capital of the island. From Fira’s lofty summit, we were treated to miles of stunning panoramic views that completely captivated us. Quaint cobbled streets weaving through the town led past small boutiques brimming with jewelry, artisan treasures, and local crafts. Charming and colorful restaurants offering traditional Greek fare added their magnetic appeal. At Lithos Restaurant, we were properly introduced to an authentic Greek Salad, a delicious lettuce-free dish consisting entirely of fresh, tantalizing pieces of tomato, feta, and of course, crisp Greek olives. Perched on the northern part of the island, the village of Oia is situated on top of an impressive cliff, offering spectacular views over the volcano, Palia, and the nearby island of Thirassia. Its charming dazzlingly chalk-white houses, narrow meandering streets, blue domed churches and sun-bathed verandas provide views seen only in postcards – but no postcard was ever so lovely as the stunning vista we enjoyed and imprinted forever to memory. The town was sleepy and quaint. Quieter than Fira, and utterly bewitching, Oia beguiled us to savor the moment. And so we did with a glass of fine white Greek wine on a terraced balcony overlooking the sea. We drank it all in – the soft gentle breeze, the warm sun on our faces, and the magnificent and magical vista of white and blue surrounding us in the village, the sky, and the sparkling, cerulean Aegean Sea. 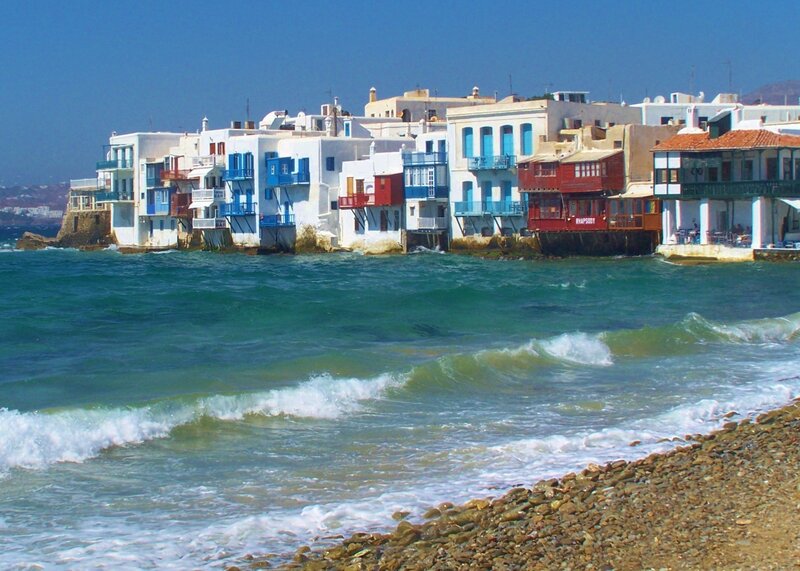 One of the favorite Greek Island destinations and a favorite with cruise ships, it’s hard to imagine a time when Mykonos, Greece was a humble little island, without electricity. Things changed in the 1950s, with the arrival of Aristotle and Jackie Kennedy Onassis, Maria Callas, Marlon Brando, Grace Kelly, and Elizabeth Taylor. Renowned to be Greece’s party island, nighttime or day, the island is hopping with energy and excitement, yet maintains the distinctive charm of a fishing village. 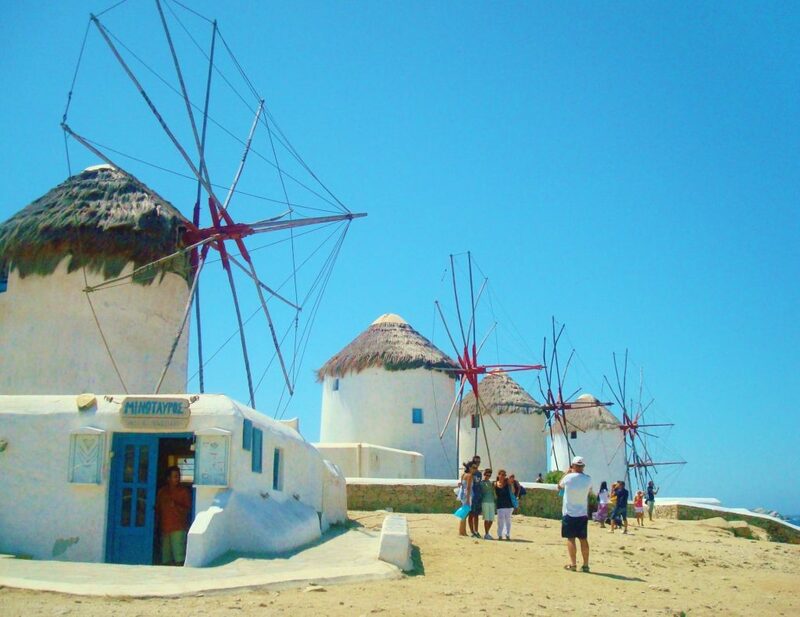 But, it’s the seven windmills standing imposingly on a hill with a luminous blue skied backdrop that are the quintessential feature of Mykonos. Built by the Venetians in the 16th century, these windmills, though no longer functional, are living testimony of the island’s use of innovation when it came to tapping the enormous power of the wind to grind grain. The windmills are open to the public, and two are now part of a museum. The western part of town meets the sea at Alefkántra or “Little Venice”, an 18th century sea captain’s housing district perched precariously on the edge of the sea with colorful windows and balconies overhanging the azure water. 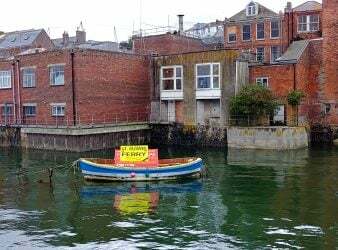 During the 16th and 17th century, pirating was common in these islands, and it is believed this area was instrumental in the rapid loading or unloading of cargo from visiting vessels. Today Alefkántra’ s unusual structures now host trendy bars and restaurants, with some of the best views of the Aegean Sea. 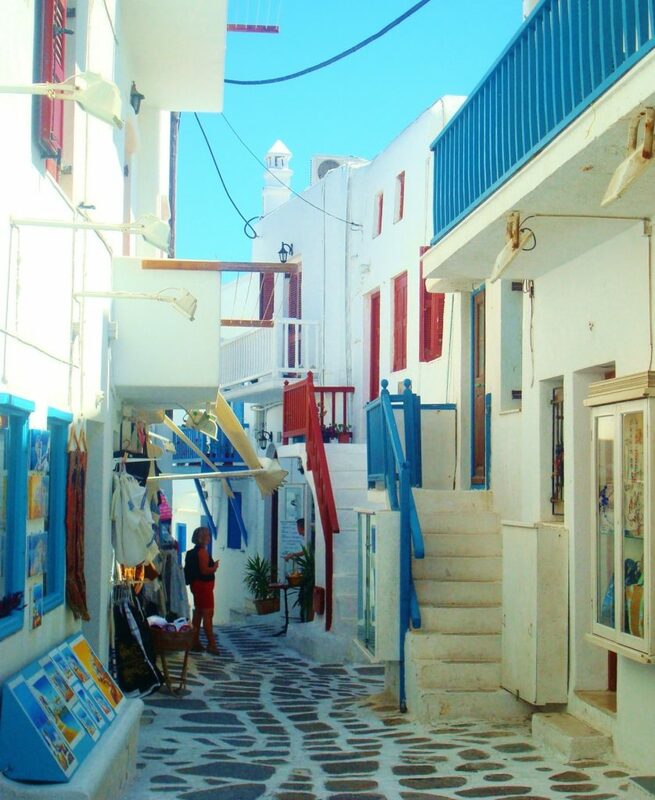 And, speaking of pirates, the narrow meandering pedestrian shopping streets and twisting alleyways of the harbor town of Hora were intended to fool pirates and thwart invaders who landed on these shores. 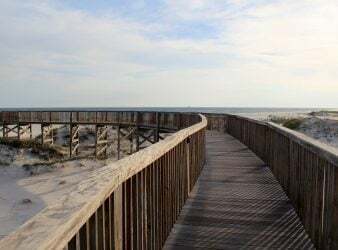 It’s easy to get lost without imbibing in an alcoholic beverage in the confusing maze of labyrinthine corridors, so, it’s not hard not to imagine it being quite impossible for the pirates. Some shop-filled alleyways end abruptly serving as deliberately designed cul-de-sacs where the townspeople could ambush their pillaging invaders. Wooden balconies hang from white cubical houses, outdoor staircases are lined with pots of geraniums, and oleander and hibiscus scent the air. The absence of motorized traffic in this area makes the experience even better as we follow paving stones etched with whitewashed trim past expensive boutiques leading from the square into the Old Quarter of the town. You can’t get closer to the water, than having lunch at Kadena right on the harbor’s edge. The restaurant’s location was perfect for people watching, one of the favorite pastimes in Mykonos. We shared grilled halloumi, a semi-hard Greek cheese made from sheep and goats milk, prepared with lemon, garlic and dill. Our main entrée was the best Moussaka we have ever tasted. The eggplant and ground lamb with a white sauce was superbly spiced and cooked to perfection, and every bite was like eating a piece of “foodie heaven”. After lunch, we rented motorbikes and ventured north to the more barren, windswept, but immensely beautiful, almost untouched part of the island. Exploring Mykonos this way took us to remote areas and beaches where the scenery was some of the most stunning we have ever seen, with views that seemed to go on forever. Famous American writer, Henry Miller once wrote” It takes a lifetime for someone to discover Greece, but, it only takes an instant to fall in love with her”. That could not be more true. Santorini and Mykonos truly share a siren’s call and many are the moments we feel them beckoning us to return. 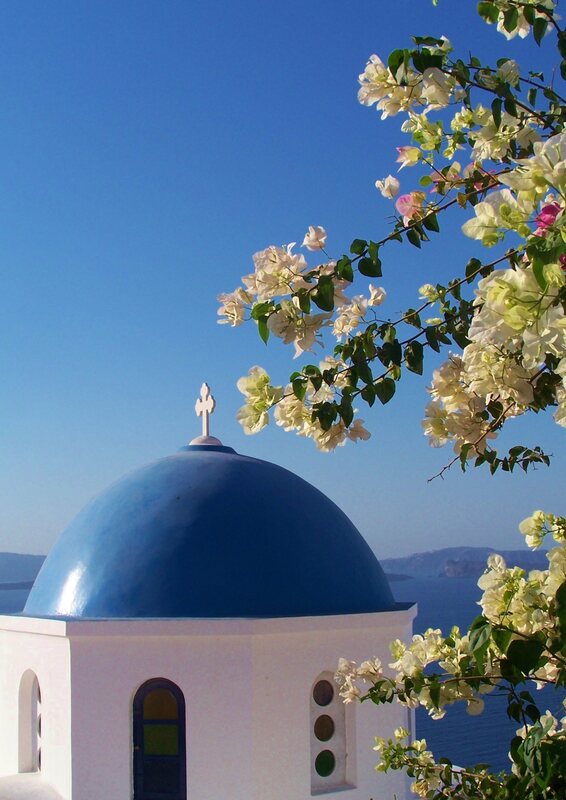 We love the Greek Isles and welcome any opportunities to return there. Such a beautiful country with waters so blue. Never been to Santorini though. Thankfully the Greek economy seems to be finding some stability now.